Keeping a boa constrictor healthy requires good husbandry and vigilant observation. Drooling can be a symptom of a boa drinking too much water -- which isn't a serious problem -- or it can be the result of a potentially deadly respiratory infection. Exposure to sick animals, being kept in dirty conditions and stress can all cause illness in boa constrictors. 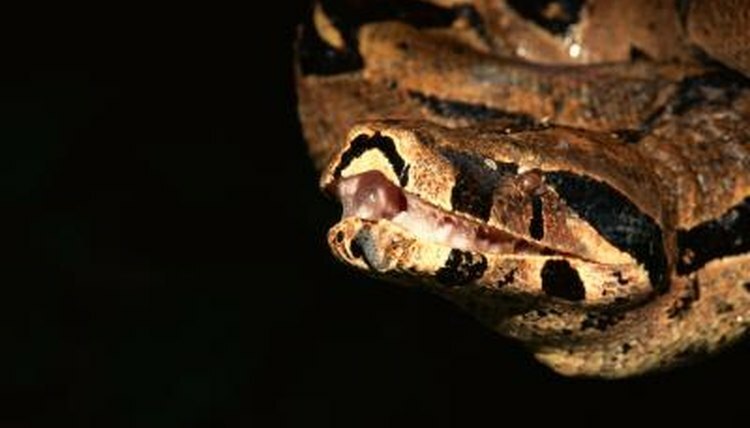 Respiratory infections in snakes are serious medical conditions; some boas are susceptible to a specific pathogen that is often fatal. Snakes with respiratory infections can exhibit any of a number of symptoms: lethargy, labored breathing, mouth gaping, strange postures, irritability and drooling. Unfortunately for boas and their keepers, respiratory illnesses can also be asymptomatic. Before jumping to the conclusion that your animal has a respiratory infection, be sure that it hasn’t recently drank a large quantity of water. When snakes do this, they sometimes regurgitate some of the water -- particularly if they have been recently handled. If your snake begins to drool water, place him back in his cage and leave him alone for several hours so his body can absorb the excess water. The best way to combat respiratory illness in snakes is to prevent it from happening in the first place. This begins with acquiring a healthy snake from a reputable source. Unless you are attempting to breed boas, snakes should be kept in perpetual quarantine. Wash your hands before touching your boa constrictor to prevent spreading germs from your hands. The same thing goes for tools and instruments; don't use tools in a healthy snake's cage that you have used to treat a sick snake. Additionally, it is a good idea to always tend to sick animals and their cages after you care for your healthy ones. It is important to provide excellent care boas to prevent stress and susceptibility to opportunistic pathogens; monitor the temperature and humidity, and keep the habitat clean. If your boa constrictor starts drooling or wheezing, or has labored breathing, immediate action is required. Immediately verify that the habitat temperatures and humidity are appropriate; make an appointment with your veterinarian; and let the snake rest quietly until the vet has seen him. The veterinarian will likely take oral and blood samples and prescribe an indicated antibiotic. Treatments may need to be repeated several times.